Who didn't love Screaming Yellow Zonkers? Did you know they are GONE? In my head, I mix them up with Fiddle Faddle, Crunch 'n' Munch and Poppycock. They all seem to have been made by the same snack company, Lincoln Snacks, which later was acquired by ConAgra., who discontinued SYZ in 2007. 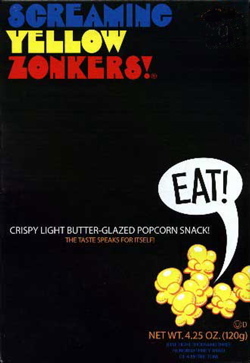 I gotta admit, I think of Screaming Yellow Zonkers as the ultimate stoner munchies. Maybe it's the name, maybe the Sixties-era psychedelic packaging, maybe it's because it's too easy to eat an entire box. Did you ever eat this stuff, or did you prefer Fiddle Faddle, Poppycock, or plain old Cracker Jack? Did you realize it had been discontinued? I'm neither surprised not shocked -- though I am disappointed -- that Screaming Yellow Zonkers aren't around anymore. Two things made them great: the name, of course, and their flavor, which was sweeter and lighter than caramel-coated popcorn. These were called "Lollygobbleblissbombs" in Australia and a better name to describe them I cannot imagine! I always chose Chrunch N Munch over SYZ. I wrote the company last year and begged that they make them again. They still could make a comeback! I mean - even TACO DORITOS just recently made a complete comeback! Please make SCREAMING YELLOW ZONKERS again!! So bummed to hear that SYZ are gone!